Aaron Kates Rose was an IILJ Scholar from 2012-2015. 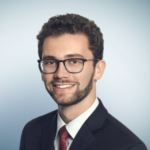 He has experience working as an Online Communications Coordinator for Constitutional Transitions at NYU Law, as a Legal Liaison at the United Nations International Law Commission, and as a Human Rights and Advocacy Intern at the Legal Center for Arab Minority Rights in Israel. Since receiving his J.D. from NYU Law in 2015, Aaron joined Freshfields Bruckhaus Deringer LLP as an associate.